Viscoelastic coagulation testing has long been recognized for the value it brings to clinical evaluation of hemostasis. Until now, the complexity of the technology, demands on operator interface, and high costs associated with the purchase and maintenance of the available equipment has limited the clinical utility of this analysis. 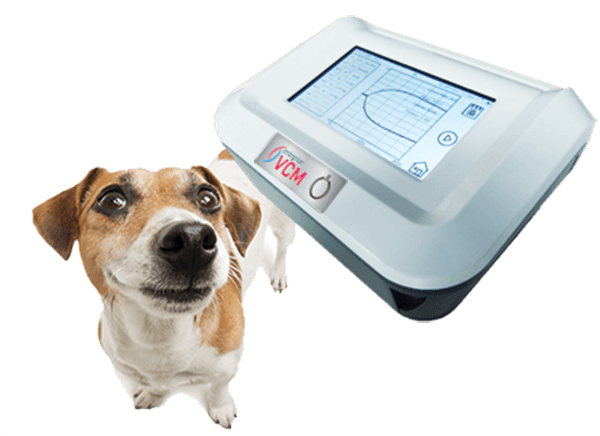 Entegrion’s VCM Vet is an advanced viscoelastic testing monitor that provides rapid, real-time hemostasis assessment at patient side. Designed as a true point of care solution, the VCM Vet offers flexibility, ease of use, portability and quality results. 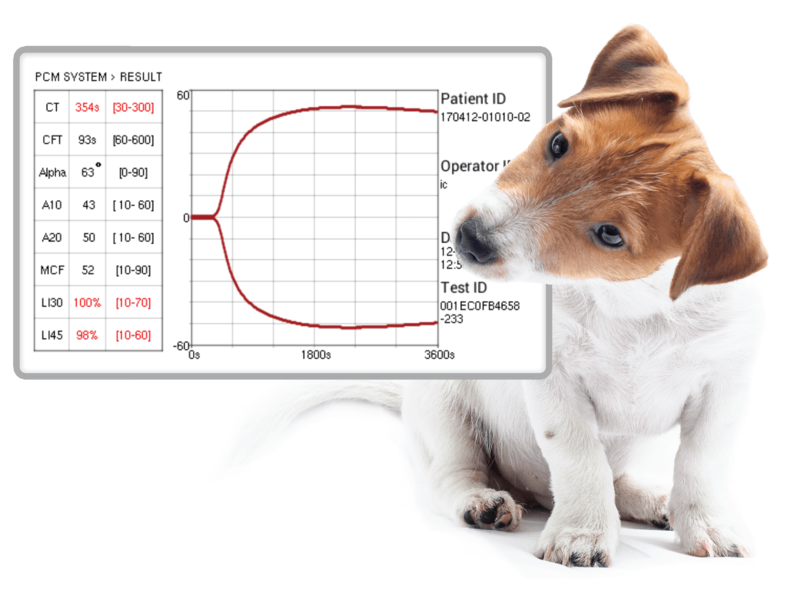 Being fully automated and using untreated whole blood samples, VCM Vet for the first time brings an economic, reliable, and flexible hemostasis assessment to veterinary and animal science practices. In just three steps VCM Vet will provide a patient’s global hemostasis profile. Whether running in the most up to date facilities, or in the field, VCM Vet provides rapid, reproducible and high quality results. Immediately at your patient’s side assess hemostasis status, diagnose and adjust therapies without waiting for results to come back from the lab. Real-time, point of care viscoelastic coagulation monitoring. More complete, actionable, real-time coagulation information in a cost-effective solution. VCM Vet's viscoelastic testing gives you a greater understanding of your patients' coagulation status. VCM Vet has been designed to work as easily in the field as it does in the clinic. We have removed variables that can cause inconsistent unreliable results. VCM Vet is fully automatic, requires no chemistry and uses a whole blood sample directly from a syringe. 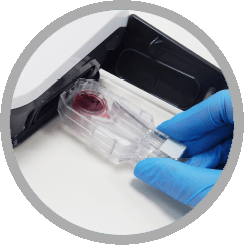 The system allows you to access your patient's hemostasis status at patient side. Pets, farm and production, and exotic animals, can all benefit from the VCM Vet. The portability and ease of use of the VCM Vet allows you to assess animals of all kinds any time hemostasis analysis is relevant. Load fresh whole blood directly into the cartridge from syringe. 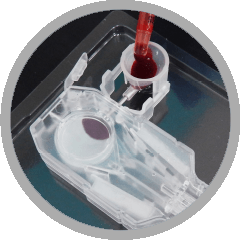 Once the cartridge is inserted into the VCM, the system will automatically begin to monitor the sample’s time to clot formation, rate of clotting, maximum clot strength and fibrinolysis. Within minutes easy to read, real-time results appear on the VCM Vet screen right at point-of-care, allowing for a global view of the patient’s hemostatic state. 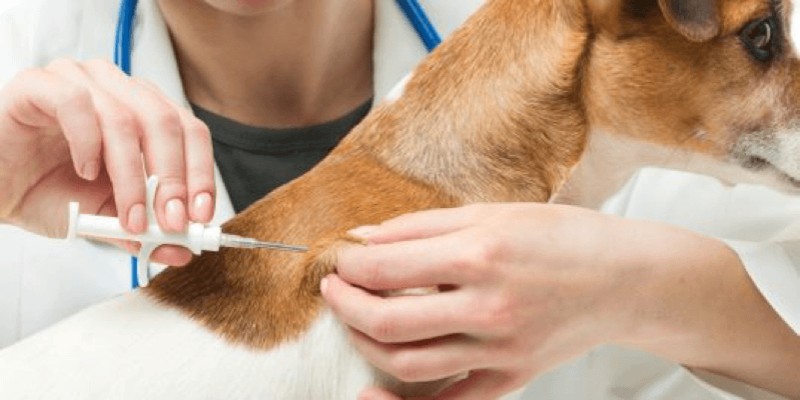 How does VCM Vet work? VCM Vet provides hemostasis analysis using viscoelastic coagulation testing. Key parameters that describe the rate of clot formation, the strength, and stability of a clotting blood sample are measured using a proprietary mechanical process. The measured parameters are displayed both numerically and graphically in real time as the blood sample begins to clot, reaches maximum clot strength, and then resolves through fibrinolysis. Because the instrument is available at patient side, the fresh blood sample can be introduced directly into the VCM Vet. The sample is not manipulated with chemistry, and the test begins automatically when the VCM Vet test cartridge is inserted into the instrument. The results of this sensitive assay are available for the doctor to view as they are developing. Contact us for more details or a demonstration. How much does VCM Vet cost? The VCM Vet is designed to be simple to use, not requiring a highly trained laboratory technologist, with the objective of making this valuable clinical tool accessible to all veterinary practices. We offer a number of programs that make acquiring a VCM Vet easy for general, emergency and hospital practices. What information does viscoelastic testing give me that PT/INR doesn't? PT/INR was originally developed to assess the effect of anticoagulation on a patient, and has become widely used to diagnose coagulation in numerous circumstances. PT/INR provides a measure of the time it takes for a clot to form, indicating the functioning of only part of the coagulation cascade. Viscoelastic coagulation testing provides information in real-time about the rate of clot formation, and the strength and stability of a clotting whole blood sample. This more complete description of the functioning of a patient’s hemostatic system represents critical information for guiding clinical intervention that is not available from PT/INR and other more commonly used coagulation tests. A Division of Entegrion, Inc. If you have more questions about the VCM Vet contact us today.